When you’re stuck in a rut, everything starts to feel like a plateau. It takes more energy to complete daily tasks, and you feel as if there’s little point in your efforts. 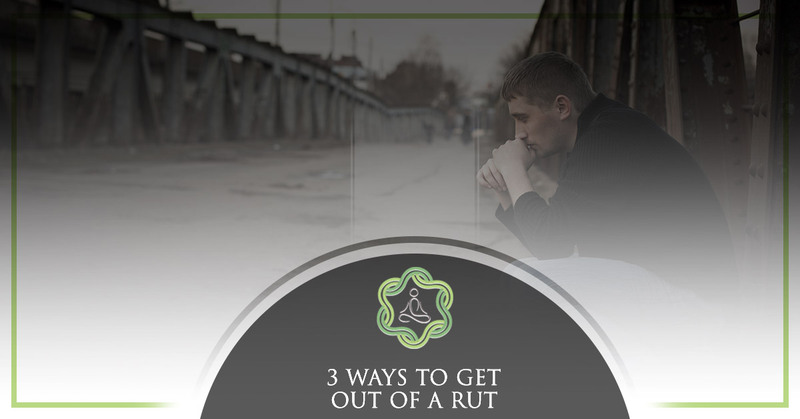 The worst part about being stuck in a rut is that there isn’t always a clear way out. It’d be great if you could magically win the lottery, move across the world, or turn back time. But realistic solutions to unsticking yourself are a bit harder to grasp. If you’re feeling sedentary and need a change of pace, consider these three strategies. Sometimes it just takes one catalyst to spur a positive reaction. It might seem like a no-brainer, but getting outside is one of the absolute best things you can do to re-motivate yourself. If you tend to fall into a 3 p.m. slump and this is when feelings of “stuck” hit, preempt them. Force yourself to get outside every day and take a walk. Even if you live in a cold-weather climate, bundle up. Getting outside is worth it. For those who already enjoy outdoor activity, set a small yet attainable goal for yourself. If you hike, make a list of five hikes you will try in the next two months. If you bike, make it a point to ride to work at least three times a week. The opportunities are endless — which in itself can be intimidating. No matter what, just get outside and give yourself a pat on the back when you do. We know, we know. Meditation is one of those “go-to” strategies for just about everything these days. Have a stomach ache? Meditate. Want to lose weight? Meditate? Want to earn five million dollars in a year? Meditate. The thing about meditation is that it’s actually really powerful. According to a Harvard research team, meditation literally changes the gray matter in our brains and helps us to improve memory, sense of self, empathy, and stress. Especially for “sense of self” bolstering, meditation can really help for those who feel stuck. It gives a method to understand and ultimately shift cognitive habits. If you’re not sure where to begin, try a mindfulness app like Headspace. If you’ve tried the basic methods and still feel stuck, it might be time for a more life-changing approach. Enter: an ayahuasca spiritual retreat. At Soul Quest Ayahuasca Church of Mother Earth, members have access to a supportive community, traditional ayahuasca ceremonies, and to spiritual guidance. Those who have taken ayahuasca, a sacred South American plant, experience full-body purification, healing, and clarity. It’s an incredible, powerful way to get out of a rut — and to stay out of it. Learn more about the magic of ayahuasca today at Soul Quest Ayahuasca Church of Mother Earth, a spiritual retreat center in Orlando. Instead of needing to travel to South America for over-priced, expropriated ceremonies, you can benefit from the life-changing effects of ayahuasca in Orlando. Contact us today to learn more about this unparalleled experience.